Today I want to share a recently completed project that I’m sure you will enjoy seeing. How about a little background info first? I have had the pleasure of working with these clients on their previous home, and they’re great to work with. Not only are they trusting and decisive, but (added bonus) they had a pretty clear vision of the direction they wanted this new home to take! And speaking of the new home, it’s a downsize from their previous home and it’s a gorgeous newly constructed home that they bought upon it’s completion. 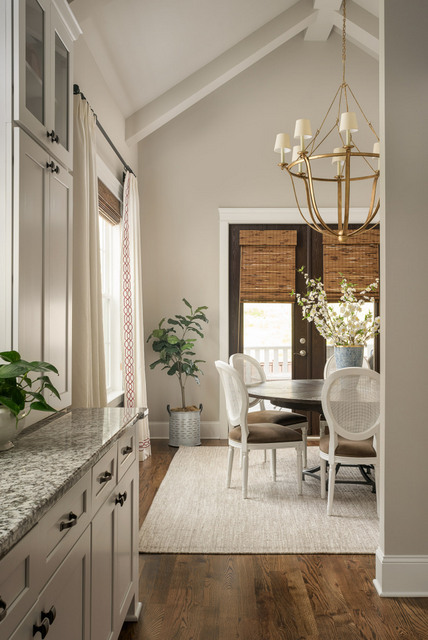 All of the finishes ( paint colors, cabinets, countertops, tile, stain colors, etc) were already selected when the clients made the purchase, and they provided a wonderful light and neutral backdrop for the furnishings. 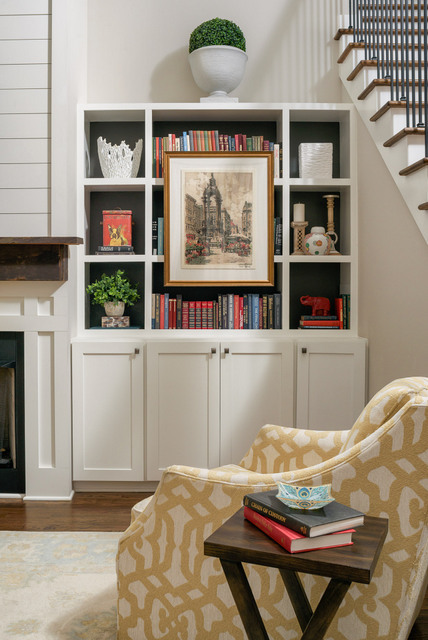 The clients’ former home had an Old World French style of architecture, and although it was a beautiful home and a good fit for them previously, they were ready to embrace a lighter, cleaner aesthetic in the new digs. Like many of today’s new homes, the main level is quite open! 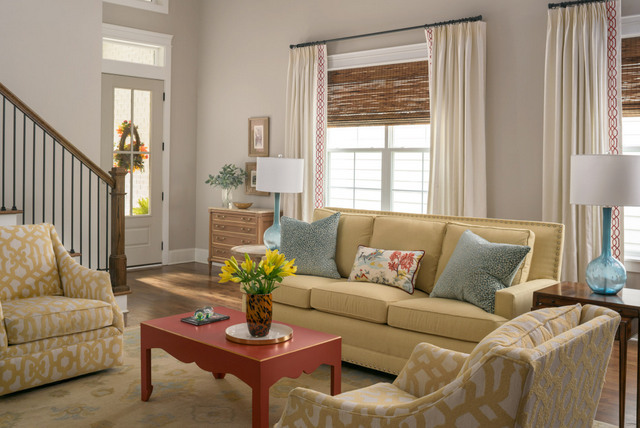 We decided to work with the existing paint color (a light, warm greige,) and add color through furnishings and accessories. All of the furnishings you see here are new, with the exception of the nesting table set to the right of the sofa. The clean lined legs made these tables a perfect fit for our new direction! Although there is no dedicated foyer, we created an area to drop keys and mail by adding a small chest near the front door. And here’s the opposite side of the room. We added a little drama by painting the backs of the bookcases off-black, which provides a stronger silhouette for the items on the shelves. Newer homes that are very open don’t offer a lot of wall space to hang art, and we loved these prints from the clients’ previous home. Our solution? We placed them on the front of their built-in bookcases. I love a little of the unexpected! The ceilings are very high in this area, and the topiary urns act as finials to each bookcase. This is the view from the front door, looking through the living room and kitchen into the dining room. The vaulted ceiling created a great opportunity for some design drama, so we capitalized on that opportunity and swapped out the builder’s fixture for this stunning gold showstopper. Yes, it’s large, but since it’s simple in form it doesn’t feel too heavy. 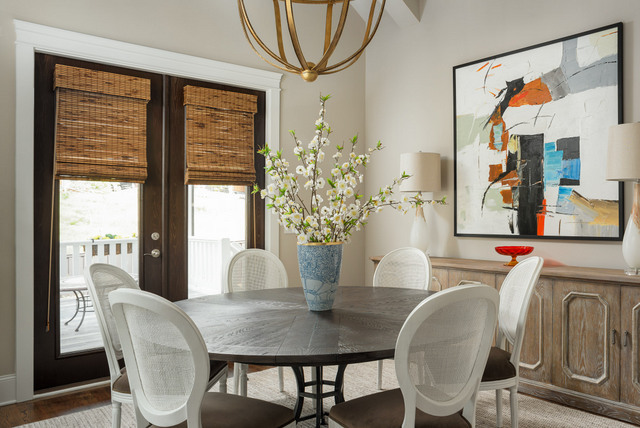 The Louis dining chairs are from my clients’ previous dining room, and they work perfectly in their new home. Here’s closer look at the dining room . The table and buffet have a slightly weathered finish, which contrasts beautifully with the modern art and contemporary chandelier. The overall aesthetic is very clean and simple, which makes a perfect backdrop for family dinners and casual entertaining! The master bedroom is also located on the main level and it came with some wonderful architectural details. My clients opted to change the paint color to a restful blue. 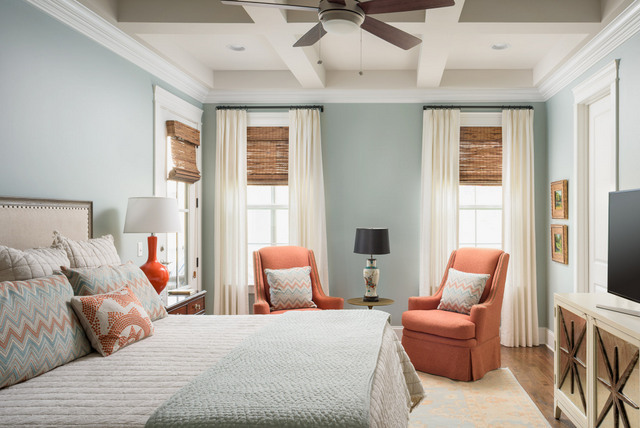 They had used this very color in their previous home, and it’s such a lovely color we were eager to incorporate it into their new home. This room gets some beautiful natural light. We also love the coffered ceiling, hardwood floors, and tall doors. The chairs, bedding and pillows were brought over from the clients’ previous home. Everything else was selected to work with these design elements. I think the takeaway here is that with some careful selections, you can create a feeling of calm and enjoy some color at the same time! We opted to create a fun, bohemian look on a main floor bedroom that is used by the client’s adult son when he is in town. A clean-lined low brass bed is flanked by vintage mid century modern end tables topped with smoked glass. 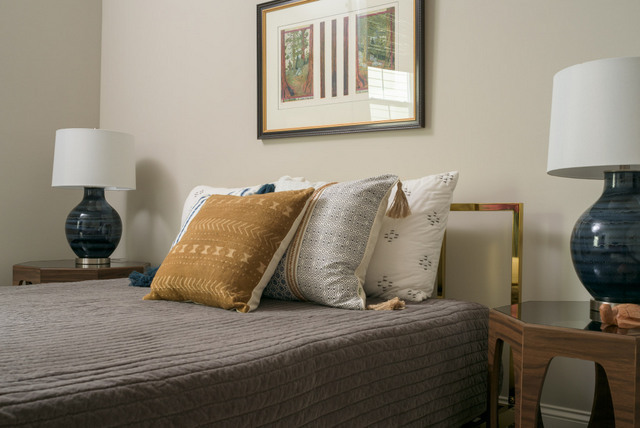 The charcoal velvet quilt is accented with mud cloth and bohemian inspired pillows. The end result is completely appropriate for guests while pushing the envelope a little. I hope you enjoyed touring the main level of this lovely home today. In my next blog post we’ll tour the upstairs rooms. Hope you’ll stop by again for a look!